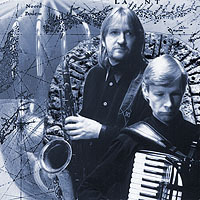 The sax player Villu Veski and the accordionist Tiit Kalluste are both men well-versed in matters jazzy, folksy and improvisatsional. His repertoire includes classical compositions for alto saxophone and large amount of music for saxophone quartet. In the field of Jazz he prefers old swing style, etno-jazz and funky-groove. – He has performed frequently on Festivals of Estonian Music and on Contemporary Music Festival NYYD, performing new works of Estonian composers. He has done first performances of saxophone concertos by Estonian composers Eino Tamberg and Hillar Kareva, both written specially for him. He has participated in all Jazz Festivals in Estonia, in many Scandinavian festivals: Pori International Jazz (1988/1999/2001), Bergen Nattjazz (1994), Copenhagen European Cultural Capital „Artgenda ’96“, as well as in Tbilisi International Jazz Festival (1986), Festival „Ossennije Ritmy“ in Leningrad (1990), „Stupenka v Parnass“ in Moscow (1990), Adolphe Sax Festival in Dinant, Belgium (1994). – Villu Veski has been active as composer as well. He has created music for TV-ads, in 1999 he created music for TV-documental „Around the World in 90 Days“ with 13 parts, which have been shown on Discovery Travel Channel, BBC/Flextech UK Style and TVF International.